DCED Secretary Dennis Davin (above, right) reads a proclamation to Margie Young (second from right) and Erica Rogler (third from right) of the Wyoming County Cultural Center and Dietrich Theater after they accepted the Route 6 Alliance Artisan of the Year Award from Alliance president Kevin Abrams (left). The awards program was the culmination of a the two-day annual conference of the Alliance held this year in Tunkhannock. 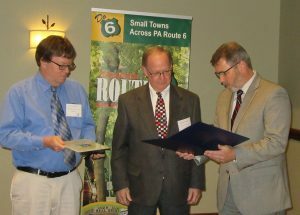 Members of the Route 6 Alliance held their annual two-day conference in Tunkhannock on May 17 and 18. Tunkhannock was chosen by the Alliance last year as the PA Route 6 Community of the Year. 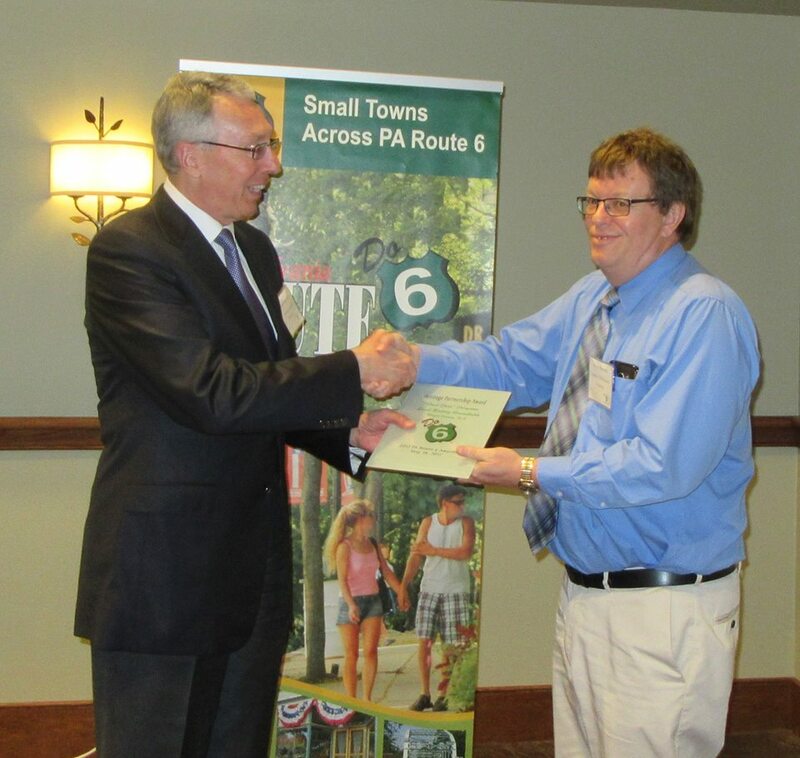 The Route 6 Heritage Corridor stretches from Erie County to Wayne County across northern Pennsylvania, overlapping several other heritage regions, whose members were in attendance. 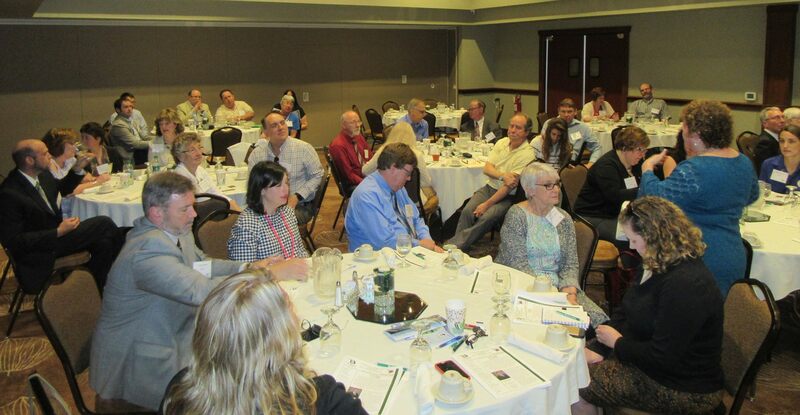 On May 17, Alliance members and their guests participated in a workshop geared towards strengthening downtowns, a challenge shared by members from one end of the state to the other. About 20 people participated in a guided Historic Tunkhannock Walking Tour, which was developed in 2016 in part with Route 6 Heritage Corridor funds and proved a key element in Tunkhannock’s “Community” designation last year. A tour of the Dietrich Theater and Wyoming County Cultural Center was offered to Alliance members after the Walking Tour, as was wine sampling. Guests were encouraged to do some exploring in Tunkhannock on their own as the evening waned. 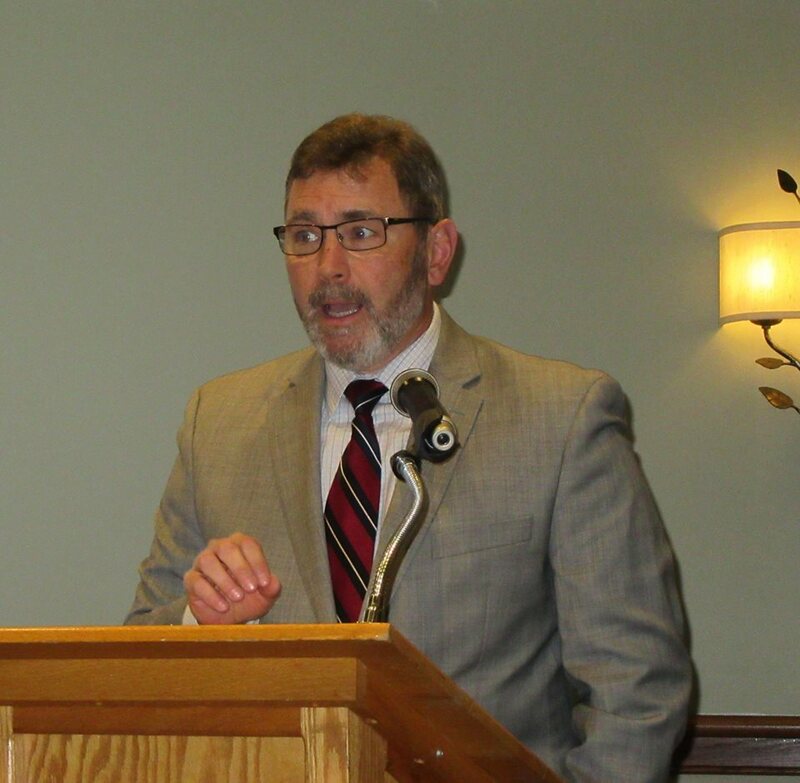 On May 18, guests gathered again at Shadowbrook Inn & Resort (top), east of town on Route 6, for the annual business meeting of the Alliance that included an election for next year’s board and featured keynote speaker DCED Secretary Dennis Davin. Other speakers included Nancy Parlo (below) of the Tunkhannock Business & Professionals Association and Terri Dennison (above) of the Route 6 Alliance. Alliance president Kevin Abrams facilitated the event. 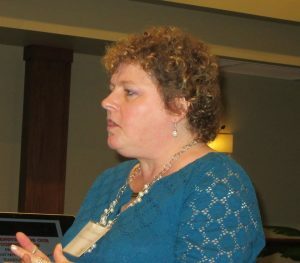 Davin (below) stressed the importance of lobbying Harrisburg to increase the state’s investment in tourism, noting that statistics prove that three dollars comes back to Pennsylvania for every dollar spent on tourism, the Commonwealth’s second most valuable industry after agriculture. From 2009 to 2014, for example, the tourism budget was cut by $125 million, resulting in a net loss to the state of $324 million. One of the more interesting new suggestions proposed during the meeting was by Wyoming County Commissioner Judy Mead, asking if it might be possible to change the wording on signage where bypasses have been constructed around towns like Tunkhannock. Dennison asked for and got a general consensus from Route 6 Alliance members and supporters across the room who immediately concurred with Mead’s idea. Davin agreed that it was a notion worth pursuing. The two-day conference ended with the distribution of a number of awards. 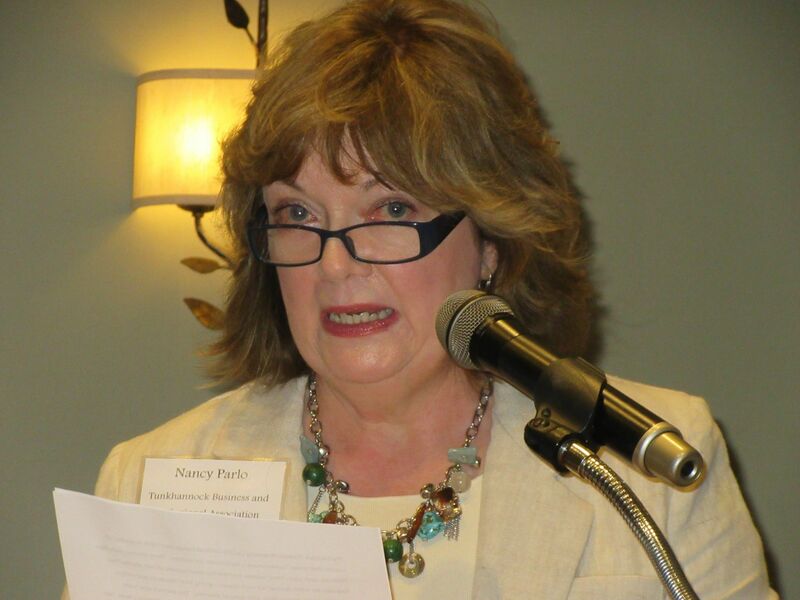 The Heritage Partnership Award went to the Thomas H. Kennedy Local History Roundtable in Wayne County for their production of a Local History Past-Port brochure. The project was chaired by James Asselstine (below, left), who accepted the award. 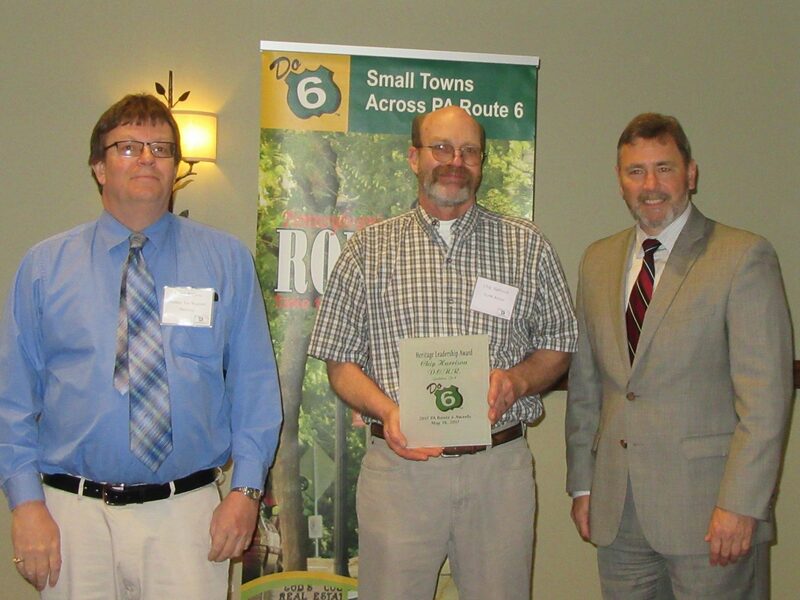 Chip Harrison (below, center), a DCNR representative from Galeton won the Alliance’s Heritage Leadership Award for his work to improve customer service and amenities at state parks in Potter and Tioga counties, including Lyman Run, Denton Hill and Cherry Springs state parks. The latter is becoming well known by stargazers around the world as the darkest place on the East Coast. The Heritage Tourism Award went to the Downtown Edinboro Art & Music Fest, which averages 8,400 attendees annually and features nationally-acclaimed and local folk musicians, and artisans. The Wyoming County Cultural Center in Tunkhannock received the Artisan of the Year Award for its wide variety of offerings to the community, including art exhibits and instruction, historical presentations, and the screening of current, foreign, independent, and classic films. 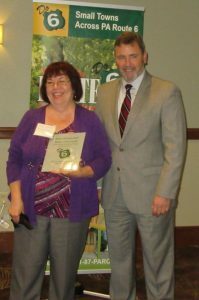 The city of Warren was named the Heritage Community of the Year. 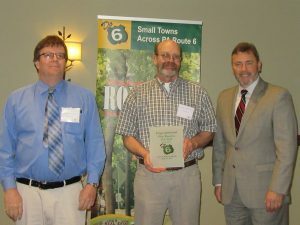 In accepting the award, Warren city councilman Gregory Fraser (below, center) also accepted the honor of hosting next year’s Route 6 Alliance conference in May 2018. 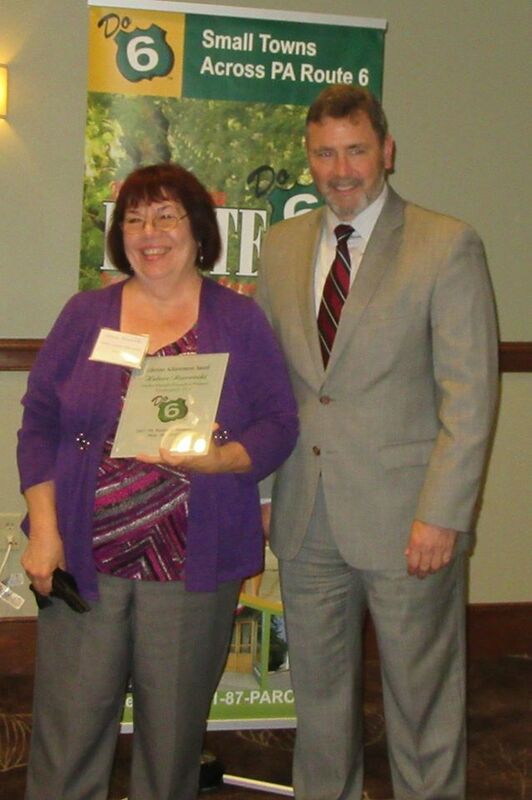 The final award of the day was bestowed upon Helene Nawrocki of the Potter County Education Council. 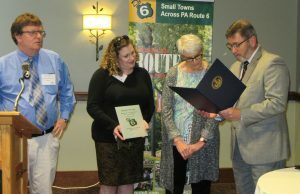 In addition to the extensive work she has done for the Route 6 Alliance, Nawrocki (below, left) is an adviser at the Potter County Artisan Center and manages her own business, Bear Mountain Herbs.